So after class one day this week at the Genealogical Research Institute of Pittsburgh, a student Anita Boyd had a question. She had come across a court case involving an ancestor’s slaveholder and the key argument in the case was over the ownership of three slaves. It was an estate case, a fight over an inheritance. And tucked neatly — and incomprehensibly — into the discussion in one paragraph was the comment that a central claim by the plaintiff against the defendant was devastavit. Even The Legal Genealogist had to look that one up. 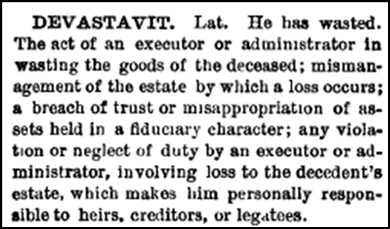 In other words, the plaintiff in the case was arguing that the defendant in the case had committed some act with respect to the estate she was managing that caused the estate to lose valuable property — the three slaves. Not in that particular case, since the court found the defendant hadn’t done any such thing. But whenever you come across it, that’s what it is: a claim against the person handling an estate accusing that person of wasting assets.